John Harlow hopes his story inspires a younger generation to find work here rather than move away. MADISON — For John Harlow, staying home in Maine was always important. Harlow, who graduated from the University of Maine Farmington in 2013 with a background in media studies, is the station director for Somerset Community TV 11, formerly known as Channel 11. Harlow said that when he first came on board, the station felt antiquated, from its programming to its equipment. It was airing funerals. Broadcasts were played from DVDs. So Harlow, 27, changed things. The Athens resident, who also graduated from Madison Area Memorial High School, brought the studio into the digital age. He diversified the programming to include more community-oriented segments in addition to broadcasting Board of Selectmen meetings and town announcements. Now, programming is downloaded onto a server. “The physical space has changed since I’ve been here,” he said. 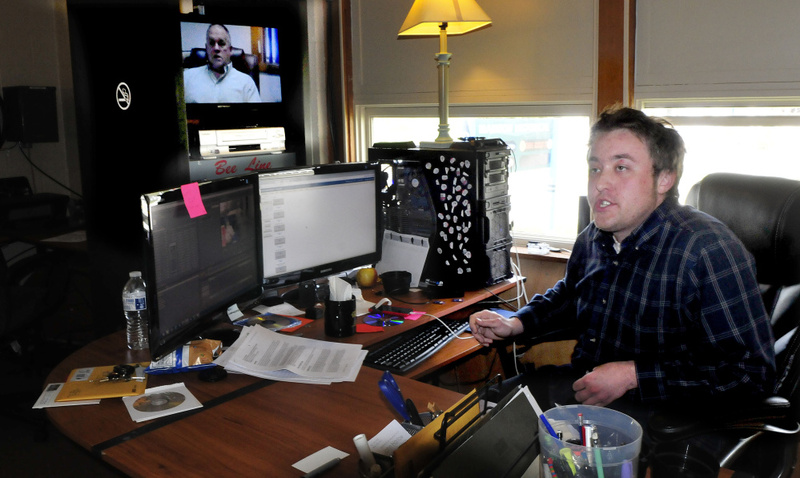 The station, which sits at 108 Old Point Ave. in Madison, consists of two rooms, a large studio space and a smaller office where Harlow edits video. He allocated a portion of the station’s budget to buy new lights and high definition digital cameras and microphones to modernize the studio set and increase overall production value. The station, which Harlow said has been around since the early 2000s, serves three towns: Madison, Skowhegan and Anson. It has been rebranded as Somerset Community TV 11. Harlow said the original name, Channel 11, was nondescript and didn’t set the station apart. He said branding was important to help the station stand out and separate it from the old station in the minds of viewers. “The perception was it was an old folks channel,” he said. Also, Somerset Community TV 11 is now a nonprofit organization, which Harlow said had been a long-term goal for the station and will help with sponsorships and securing donations in the future. Harlow believes becoming a nonprofit is a trend more successful stations are following. He points to Mt. Blue TV in Farmington as a sister station to his that is nonprofit and has made similar modernization efforts. 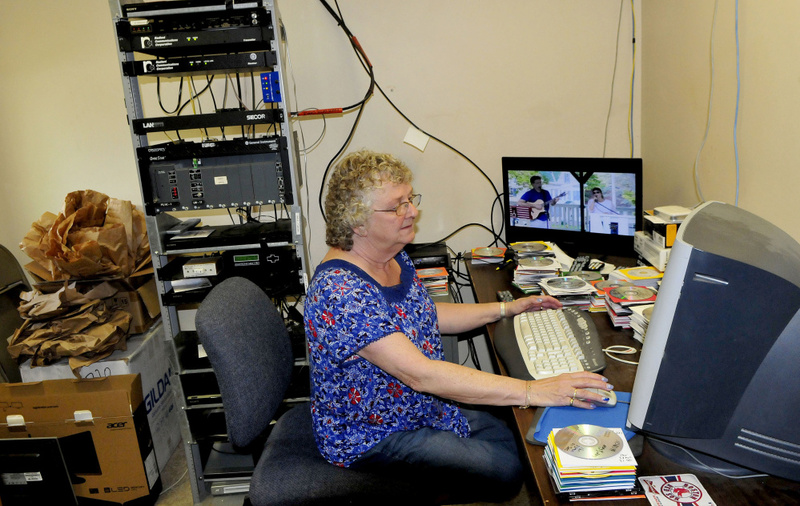 Both nonprofit status and modernization may be key to the future for local access television as cable subscriptions trend downward and the internet offers other options online. Harlow said the Somerset station reaches about 5,000 households. 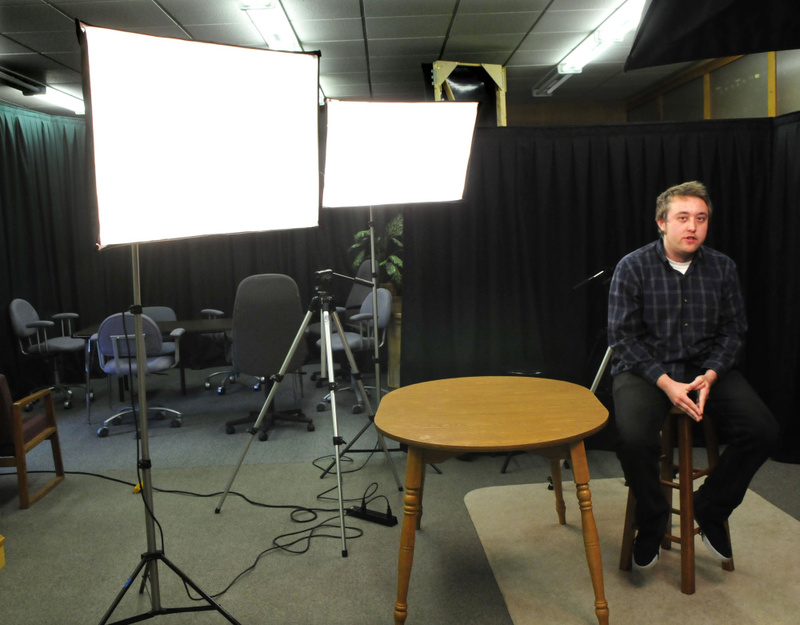 Somerset Community TV 11 has an annual budget of $67,500. Harlow said that if future funding from cable subscriptions becomes less certain, the station has other avenues for funding, such as sponsorships and fundraising as a nonprofit. Harlow said the station could also offer video services, such as loaning a person or company the station’s facilities and equipment to film a commercial. The station runs 24/7, Harlow said, every day of the year. A selection of programs runs at specific times, and Harlow decides what fills the remaining hours. The station is not always staffed, he said, because he and his crew of three often go out into the community. Harlow hopes his story inspires a younger generation to stay in central Maine and find work rather than move away. Living here and working at the station have given him the opportunity to see something grow. He said he will soon be participating in career fairs at local schools to show students they don’t have to move away to get a job in a field like his. “It’s important to me to be a positive force in the community, where I see a lot of young people leaving, and trying to do something good for central Maine,” Harlow said.